Jumanji: Welcome to the Jungle was a massive hit, so a sequel wasn’t exactly a huge surprise. However, considering the major ways the film updated the premise of the original Jumanji from over 20 years earlier, it was far from clear how the third Jumanji film would differentiate itself. While we still don’t have many of those answers, we do know one thing, our heroes will end up in new costumes in the upcoming film, and that’s something. Check out Dwayne Johnson and Karen Gillan’s new outfits in the image below. While new costumes might not be massive breaking news, it would seem to tell us something about the new movie. A recent image of the cast from Karen Gillan had shown the main cast in the same clothes that they wore in the first film. It’s unclear if this image was actually from the new movie or the previous one, but either way, it implied that we’d be getting the actors in the same outfits we got before. Although, it did promise things were not as they seemed, so perhaps this was part of the reason. When we actually saw the characters in the new film, they would look a little different. Since they’re playing video game avatars, it would make sense that the characters would end up in the same clothes, and it’s possible they may start out that way, but at some point things will change, as the Rock’s Instagram picture reveals. Based on the outfits, it looks like Jumanji 3 may be taking our characters into a colder environment, as they’re clearly dressed for keeping warm. Even Ruby Roundhouse as left her Lara Croft inspired shorts and crop top behind for fuzzy boots and long sleeves. Shifting the setting of the new Jumanji from the tropical jungle to something colder is certainly one way to change things up. The “ice level” is a tried and true element of many great video games, so it would certainly be fitting to have the video game inspired Jumanji 3 use the idea as part of its premise. The Rock’s comment on his Instagram post also appears to confirm that Jumanji 3 will continue the story of the romance between the characters of Spencer and Martha. The teenagers inhabiting the two video game avatars began a relationship in Welcome to the Jungle and it seems the pair are no less awkward even though some time has passed since they got together. 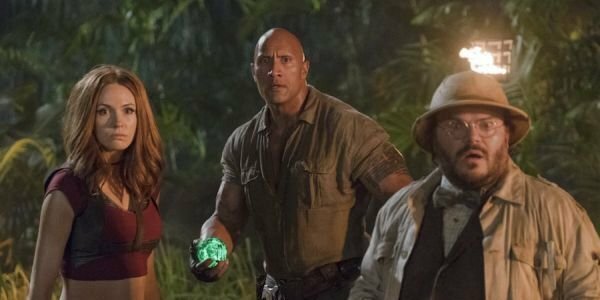 Jumanji 3 is filming right now with a release date already set for this December. It will once again go up against the newest Star Wars movie at the box office, though that battle wasn’t a major problem for Jumanji the last time around. With a fan base already looking forward to this sequel, it seems highly likely another big box office hit is on the way.